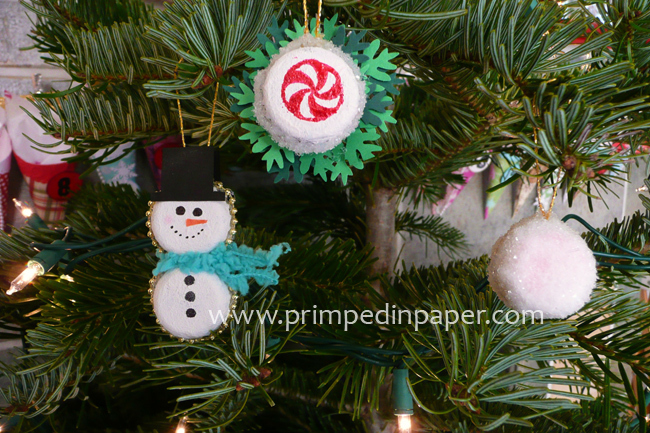 Happy December Crafty Friends! Can you believe that Christmas is just around the corner?! Which means, I’m already behind on making my Christmas cards. But Cricut Cardz Challenge has me making my first one! Challenge#122: “Tis the season!” Make a Christmas or Hanukkah card using the card feature from any cartridge, and using any colors you’d like. Faux stitching, polka dot vellum, gold perfect pearls and a festive sentiment dress this card up perfectly. For my card I used the Winter Woodland cartridge. I added some little touches to dress up this otherwise simple card. Thanks so much for your comments and coming by my blog. Please stop by Cardz Tv and join us for our last Challenge of 2012! Happy Holidays! Good Morning Crafty Friends! 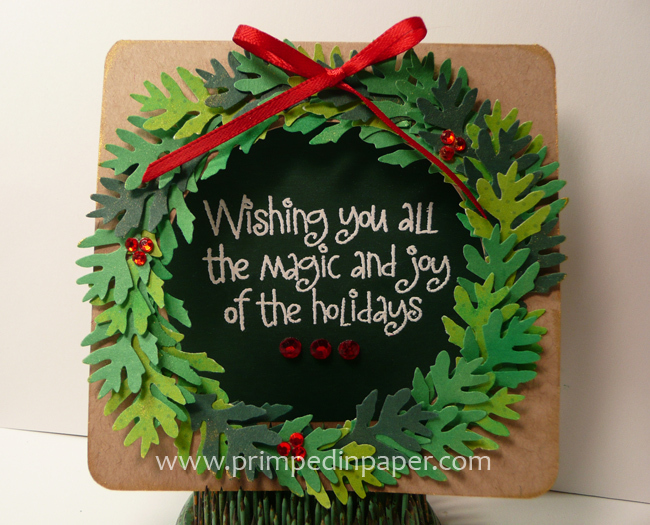 I’m excited to share my Cricut Cardz Challenge Design Team card with you today! I really loved making this card and hope you like it. This is also my first Christmas card of the year! I’m probably getting started a little late compared to most but that’s ok.
We are on Challenge #96. The Theme this week is “Christmas: Say It with S!” Make a card for Christmas using an image that starts with the letter S, using any cartridge(s) and any colors you’d like. I just love this card so much. Adding a small personal touch adds so much to this simple & cute card. 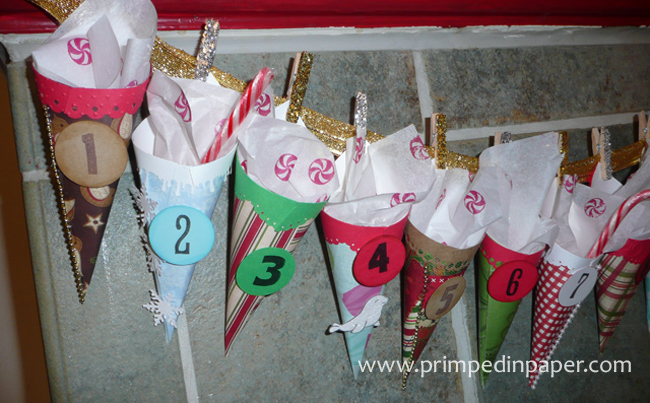 Our personalized stockings are my favorite part! If you were wondering Bunny, Tiki and Fudge are our Chihuahua’s! Here’s some pics of them hanging out. 3 Chi's cuddled up on the couch. Bunny Boo looking super adorable as she naps. Here's sweet Tiki taking in the view at the park. Here's little Fudge E. Bear at the park this Summer! Thank you so much for taking the time to stop by. I hope you enjoyed seeing pictures of my furbabies. The last three pics were taken using Intagram. If you would like to follow me my user name is cocoachi. Let me know if you follow me so I can follow you back. Don’t forget to come over to CardzTv and join us in this challenge. Mary is giving a way one her stamp sets to the winner! How awesome is that! Good morning! Brrr, it’s a cold morning here in Oregon. We had a bit of snow on Tuesday. It was pretty but didn’t last long. How’s the weather where you are? Today I would like to share with you my Design Team card for Cricut Cardz Challenge #52. This weeks challenge is to make a Christmas card using words. No images! 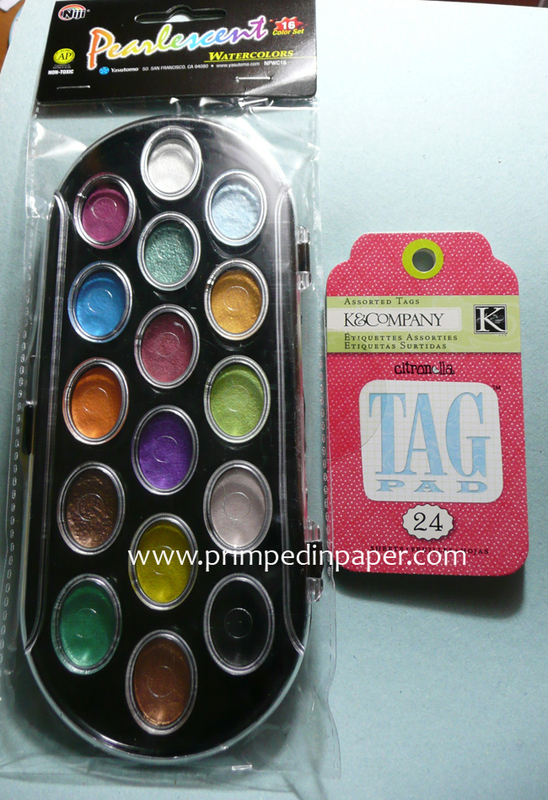 You can use any cartridges and colors you’d like. It was a great challenge and I’m lovin’ how my card turned out. Join the fun and give this challenge a try. You may be the lucky winner and be entered into the grand prize drawing for November! Holiday red really makes this card pop! 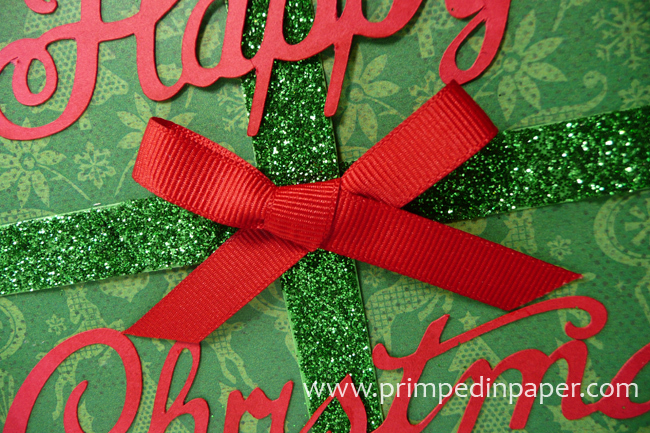 Some glitter & a bow make for a quick & festive card! 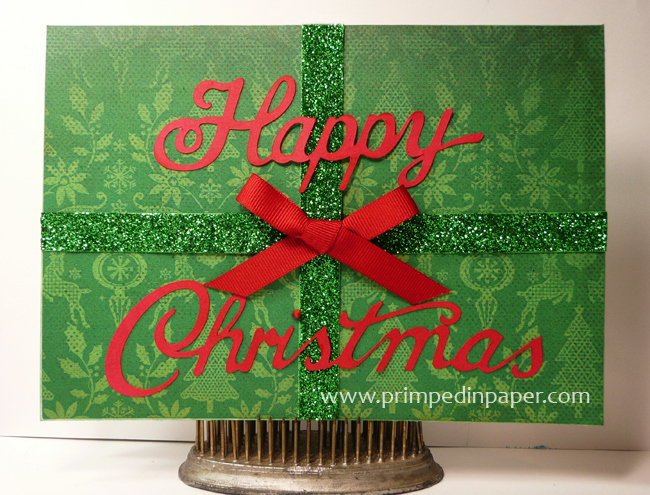 The card measures 5 x 7 and is covered with patterned paper from the DCWV Christmas Combo Stack. I cut two 1/4 inch strips of green cardstock and covered them with green craft glitter. I cut “Happy Christmas” with the Christmas solutions cart. Next I adhered all elements to the card then attached a red bow with crystal effects. Thank you so much for coming by and checking out my card. I can’t wait to see what you come up with for this challenge! If you have any questions, please let me know. 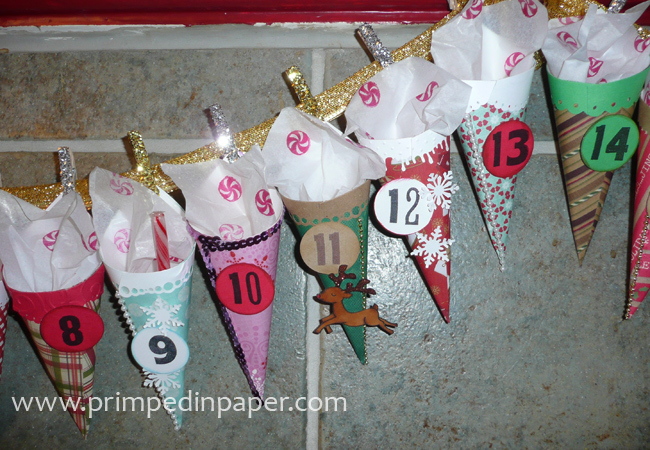 Before you leave, don’t forget… this Saturday is the Advent Calendar Blog Hop hosted by Ruthie. Please join the fun and get inspired by 15 super talented ladies!! 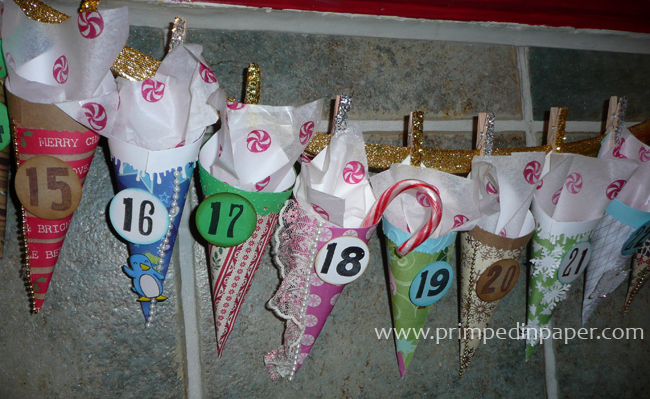 It will be lots of fun and of course blog candy at every stop! Hope to see you there! Good morning! I hope everyone is having a good week. Today is the start of another Cricut Cardz Challenge! This weeks challenge is to make a Christmas card using the card feature of any cartridge and using any colors you’d like. 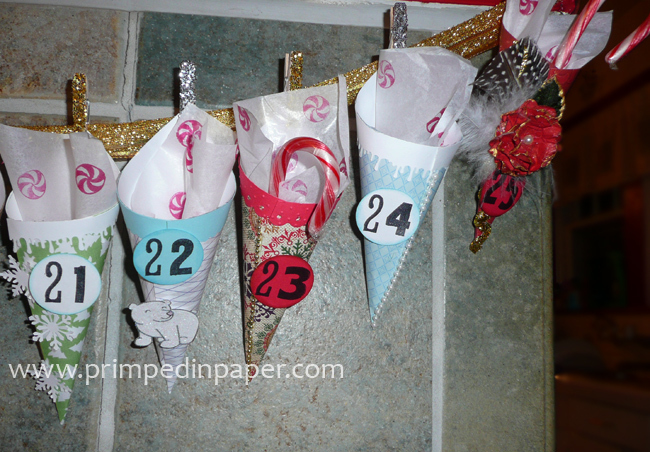 Super easy and a great way to add another card to your holiday stash. I hope you’ll join us for Challenge #50! To make my card I used the card feature on the Smiley Card cartridge. It was the perfect shape to make my wreath. The wreath is made using my Martha Stewart oak leaf punch and some red gems. The leaves are lightly dusted with Perfect Pearls in Perfect Gold. Then a red bow was added for that perfect festive touch. I inked the edges of the card front with gold pigment ink. I stamped the sentiment (Hero Arts, Owl Christmas) on dark green paper with Versamark and embossed it with white embossing powder. I adhered that to the inside of the card making sure my sentiment lined up in the center of the wreath. To finish off the card I added three red gems under the sentiment. I hope you like my card and that it gives you inspiration to join us for this weeks challenge. Thank you for checking out my card and leaving me such nice comments. I appreciate it so much.